It's the 1.8-million-copy bestselling cookbook that's become a modern-day classic. Beginning cooks will learn how to boil an egg. Experienced cooks will discover new ingredients and inspired approaches to familiar ones. Encyclopedic in scope, rich with recipes and techniques, and just plain fascinating to read, The New Basics Cookbook is the indispensable kitchen reference It's the 1.8-million-copy bestselling cookbook that's become a modern-day classic. Beginning cooks will learn how to boil an egg. Experienced cooks will discover new ingredients and inspired approaches to familiar ones. Encyclopedic in scope, rich with recipes and techniques, and just plain fascinating to read, The New Basics Cookbook is the indispensable kitchen reference for all home cooks. This is a basic cookbook that reflects today's kitchen, today's pantry, today's taste expectations. A whimsically illustrated 875-recipe labor of love, The New Basics features a light, fresh, vibrantly flavored style of American cooking that incorporates the best of new ingredients and cuisines from around the world. Over 30 chapters include Fresh Beginnings; Pasta, Pizza, and Risotto; Soups; Salads; every kind of Vegetable; Seafood; The Chicken and the Egg; Grilling from Ribs to Surprise Paella; Grains; Beef; Lamb, Pork; Game; The Cheese Course, and Not Your Mother's Meatloaf. Not to mention 150 Desserts! Plus, tips, lore, menu ideas, at-a-glance charts, trade secrets, The Wine Dictionary, a Glossary of Cooking Terms, The Panic-Proof Kitchen, and much more. Main Selection of the Better Homes & Gardens Family Book Service and the Book-of-the-Month Club's HomeStyle Books. Meh...okay, but not great. There are better cookbooks out there. I bought this one years ago and have made a few recipes from it, but not a ton. I heard so much about the The Silver Palate Cookbook, I decided to buy this one instead. I now own both, and I would say that The Silver Palate Cookbook is better. Also, I've experienced the same issue as other reviewers. The book binding is coming undone in places. Since, it's not a cookbook I reach for too often, it's not a showstopper. However, given Meh...okay, but not great. There are better cookbooks out there. I bought this one years ago and have made a few recipes from it, but not a ton. I heard so much about the The Silver Palate Cookbook, I decided to buy this one instead. I now own both, and I would say that The Silver Palate Cookbook is better. Also, I've experienced the same issue as other reviewers. The book binding is coming undone in places. Since, it's not a cookbook I reach for too often, it's not a showstopper. However, given the price I paid, I expected better quality. This is a good book for novice cooks. The recipes vary in difficulty and are easy to understand. The authors give concise explanations of cooking terms and methods, and various foods. I know a later book by Rosso (I think it was "Great Good Food") got a drubbing from the critics when it was revealed she didn't actually test all the recipes in a test kitchen. But this isn't THAT book. This does have basics like "how to cook a turkey", with some nice simple vegetable sides. This is more of an encyclopedia/ reference book than a cookbook. It's over 800 pages, to begin with. In addition to the recipes, there are countless sidebars and panels with valuable information - quotations, anecdotes, techniques, lists of fruit and vegetable varieties, wine selections, etc. There is also a wealth of information on how to set up your kitchen - what tools to purchase, what ingredients to stock up on. And you'll learn the basics of several ethnic cuisines - Moroccan, French, Ital This is more of an encyclopedia/ reference book than a cookbook. It's over 800 pages, to begin with. In addition to the recipes, there are countless sidebars and panels with valuable information - quotations, anecdotes, techniques, lists of fruit and vegetable varieties, wine selections, etc. There is also a wealth of information on how to set up your kitchen - what tools to purchase, what ingredients to stock up on. And you'll learn the basics of several ethnic cuisines - Moroccan, French, Italian, Mexican, Indian, Chinese, Thai, etc. I found myself using this as a research manual rather than actually preparing recipes, although several of them have indeed become 'basics' in my cooking repertoire - the pie crust, tomato sauce, corn chowder, california sandwiches, caesar salad dressing, carrot cake, etc. (You must absolutely try out the Carrot Cake! If you're too lazy to make it yourself, you can find it ready-made at Barbara's Food Company in Athens. 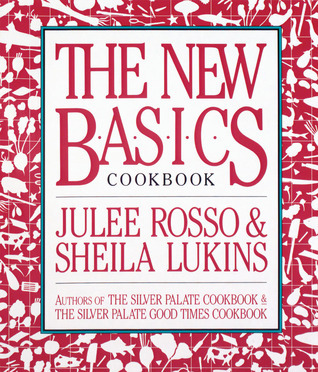 Actually, Barbara admits to relying on recipes from Julee Rosso's & Sheila Lukins' The Silver Palate Cookbook.) But there are soooo many variations and fusions, sometimes I wonder if the authors are more keen on showing us their expertise and their ability to invent trendsetting combinations than teaching us the 'basics'. It's all about having fun in the kitchen, yet sometimes I'm just looking for a simple, fool-proof recipe. New Basics was my very first grown-up cookbook, purchased with $20 of my freshman year textbook budget. I rationalized the cost because my school's Great Books emphasis meant I'd never have to buy an overpriced O-chem doorstop. Flipping through it today, I am reminded of how central this book was to the development of my kitchen ethics and culinary vocabulary. (Only after pouring over this book did I realize there was no chocolate in that fancy French dish I'd heard of but never eaten. "It's not New Basics was my very first grown-up cookbook, purchased with $20 of my freshman year textbook budget. I rationalized the cost because my school's Great Books emphasis meant I'd never have to buy an overpriced O-chem doorstop. Flipping through it today, I am reminded of how central this book was to the development of my kitchen ethics and culinary vocabulary. (Only after pouring over this book did I realize there was no chocolate in that fancy French dish I'd heard of but never eaten. "It's not 'cocoa' vin?!") I read this book cover to cover (and back again) before ever having a kitchen, studying it more assiduously than almost any other text in college. It's filled with lovely line drawings that spill over the pages. When I think "lemon zester" the first thing that comes to mind isn't the one that sits in my drawer today but rather the zester in New Basics's "Parts of the Peel" diagram. The range of recipes is enormously broad and the recipes themselves are easy to follow. Funnily, I almost never refer to it at all these days. I take it for granted in the way that I took my mama for granted as an adolescent. I'll dust it off and cook some more from it, and let you know if has stood the test of time. I think it will probably be a gift to my foodie godson when he gets his own kitchen. while i love cook books and cooking magazines, i typically don't read a cook book cover to cover. however, i'm in the delayed process of moving and had already packed all my books except 1 which i just finished. luckily "the new basics" was left out because i recently used it. what i love most about this book is not the recipes themselves but that the authors explain the ingredients used and show you many ways to use them. i've never read "the joy of cooking," but i use this book in a similar wa while i love cook books and cooking magazines, i typically don't read a cook book cover to cover. however, i'm in the delayed process of moving and had already packed all my books except 1 which i just finished. luckily "the new basics" was left out because i recently used it. what i love most about this book is not the recipes themselves but that the authors explain the ingredients used and show you many ways to use them. i've never read "the joy of cooking," but i use this book in a similar way. i'm pretty intimidated by cooking meat, but the authors explain different cuts and the best methods of preparing each one. that information alone is invaluable to me. i also love that the recipes range from the everyday ("meal in a hamburger" and a whole chapter dedicated to cookies) to the sublime (several uses of caviar and explanations of how different caviar from different types of fish taste and a recipe for a red wine sorbet). i highly recommend this book to anyone who enjoys cooking at any skill level. personally, i'm a novice, a passionate novice, but a novice none the less. If you are just starting out and have a desire to cook great food then this is the book for you. It breaks cooking down and simplifies everything. I have made many of these dishes and my family now considers them ours. I love the fajita recipe and the "guacomole is hot" and the "Black Bean Salsa". These recipes are loaded with flavor and I go to them again and again. I have given this book many times for wedding showers. Purchased this book become the Silver Palate Cookbook the our guidebook for special / holiday meals and was hoping New Basics would be as useful to our day to day meals but this wasn't too be. It's a fine cookbook, but there are numerous other cookbooks which provide recipes which were quicker, tasty, with more complete nutritional information. I’ve had this book for years, and always go back to it for great basic ideas. I have several of Julie and Sheila’s cookbooks and they never disappoint. This is a basic go to in my family for any recipe at any time. Great suggestions for menus, easy to follow, and a broad swath of recipes. A must get for a person who loves to cook. Absolutely the best cookbook on my shelves. For years. my dear friend Rosary gave me this -- my first cookbook -- and I managed to lose it during some blasted move or other! i'll have to pick up the revised edition that just came out (hopefully with full-color and copious photos?). some of these recipes are superb. OF NOTE: sheila lukins's eggplant/chevre/bechamel lasagna bomb CHANGED my freaking LIFE. it's amazing. it takes, like, several brief lifetimes to compile, but when made as written, it will not only convince you that eggplant is not gross ( my dear friend Rosary gave me this -- my first cookbook -- and I managed to lose it during some blasted move or other! i'll have to pick up the revised edition that just came out (hopefully with full-color and copious photos?). some of these recipes are superb. OF NOTE: sheila lukins's eggplant/chevre/bechamel lasagna bomb CHANGED my freaking LIFE. it's amazing. it takes, like, several brief lifetimes to compile, but when made as written, it will not only convince you that eggplant is not gross (huge hurdle!) but also that bechamel is not scary and ought to be in ALL OF THE FOODS. now, pardon me; i'm off to stir some bechamel into my coffee. oh. wait. no i'm not. a note on the production: as with The Silver Palate Cookbook, this book's line drawings are completely charming. BUT! the lack of any photographs of finished products is a huge, HUGE bummer, especially because some of the recipes are so unfamiliar to me. basically, cooking their recipes is a leap of faith, both for the flavor profiles and the lack of reassuring photographs. but what you get if you listen closely is vurrah, vurrah good. NOW done. I love that this offers basic information on common ingredients, buying advice, and suggests seasonings to complement many of the foods. However, I absolutely hate the layout. The text is tiny and crowded in to make room for oversized titles and goofy 1980's-style border designs, which are distracting and make it feel more disorganized than it probably is. A plain layout like those used in older cookbooks would have been much better, especially since there are no photographs to accommodate. I don I love that this offers basic information on common ingredients, buying advice, and suggests seasonings to complement many of the foods. However, I absolutely hate the layout. The text is tiny and crowded in to make room for oversized titles and goofy 1980's-style border designs, which are distracting and make it feel more disorganized than it probably is. A plain layout like those used in older cookbooks would have been much better, especially since there are no photographs to accommodate. I don't care for the recipes, either, but I'm not sure that's either here or there since it's largely a matter of taste, and the recipes aren't the focus of the book. Kip is now a friend, so I'm going to start reviewing cookbooks -- Yay! This is one of my favorite go-to cookbooks. When my friends were getting married in the late 90s, this is the cookbook I gave them as shower presents. Some of the recipes are dated and a little high in fat, but the techniques presented are timeless. A lot of my "standard" recipes come from this book. My pizza crust, pizza sauce, garlic vinagrette, cheesecake are all from this book. This is a collection I go to when I need idea Kip is now a friend, so I'm going to start reviewing cookbooks -- Yay! This is one of my favorite go-to cookbooks. When my friends were getting married in the late 90s, this is the cookbook I gave them as shower presents. Some of the recipes are dated and a little high in fat, but the techniques presented are timeless. A lot of my "standard" recipes come from this book. My pizza crust, pizza sauce, garlic vinagrette, cheesecake are all from this book. This is a collection I go to when I need ideas for parties. A very good read! This was a staple in my house when I was growing up, and I have my mother's copy with food stains and hand-written notes throughout. There are many recipes in here that I love to make as they are comforting familiar treats from my childhood, and many others that I've discovered as an adult. This is always a source of inspiration for parties or breaking out of a cooking rut, and I recommend it highly! Crammed with breads, salads, vegetable, grains, desserts, savories, seafood and soup. Simple and easy. Also has simple charts about the different kinds of grains, fish, greens, nuts, pastas, etc. their qualities and how to cook or use them. Good diagrams: like how to properly cut and shell a lobster and how to carve poultry, and cut meat. The tarragon chicken salad and carrot-dill soup are favorites. For a number of years, this was my go-to reference cookbook -- when I needed to know what to do with a celery root, when I was looking for a recipe for coq au vin. At the time, its new wave takes on classic dishes seemed refreshing. Now these twists feel a little dated to me, but it's still full of sound and useful advice on food preparation and entertaining, and it's well organized, so I'll often start there, even if I don't always end up there. In many ways this was the cookbook that taught me how to cook. I cut my teeth on their lasagna and Moroccan chicken. However the book hasn't aged well. I rarely turn to it these days, and when I do I leave a little disappointed. Its not a bad book and it can still help you learn the basics however the recipes are very 1980s - a little too much for my tastes these days. I know it's a little silly to review cookbooks here, but this is a really great one. It's reasonably priced and makes a nice gift. There are no shortcuts, yet the recipes are not needlesly complicated. One of the authors owns a B and B in Saugatuck, Michigan, and Chris and I went there for our first anniversary. Guess whose idea that was? This is one of those books which makes a perfect gift for someone who is getting into cooking. The included recipes are very basic and written in such a way that anyone can follow them. If you're a versed home cook, you may find the contents pretty tedious. It does live up to its title, in that it covers the basics of cooking (albeit most of which is not too "new" any longer). All recipes I have had/made from this cookbook have been GREAT! Unfortunately, for me anyway, it is not really an 'everyday' type of cookbook- there are a lot of ingredients in most recipes, they are not 'quick' and definitely not particularly healthy. It is sort of a special occasion/things to take to a party or dinner kind of cookbook for me. Provides, for its time, strikingly different interpretations of tried and true favorites. Recipes align with my own preference for strong flavors--many of them showstopping, "wow" recipes. I've been relying on The New Basics for almost 20 years and it still is the first cookbook I reach for. Even I, who really don't know how to cook, have had success with these wonderful recipes. Love the spinach, broccoli and boursin timbales (pg 285). Also recommend THE SILVER PALATE COOKBOOK by the same authors. This was my first REAL cookbook and it was given to me by a much admired cousin who is an exceptional cook. She and the silver palette are responsible for my current label as foodie! This is where it all began. Uppercrust potatoes are THE BEST potatoes ever! And I mean that! My wife and I got this cookbook as a wedding gift. After the ceremony we moved to Los Angeles. Not having a lot of extra cash to spend we used this book as our entertainment. We have made over a hundred recipes from it. And most of them are fantastic. Especially the meatloaf. My paperback edition is well used and unfortunately falling apart, so I got a hardback copy. Ingredients in this are easier to find that those required in the Silver Palate. I often give this as a gift to those starting a new household since it contains so many handy tips. This book has been my go to book for many years, I have enjoyed it very much. There are many good recipes in it. Some of the recipes call for more work than I want to do but with some tweeting I have been able to come up with many excellent meals. This book is quite dated but contains tons of recipes and great information on everything to do with cooking, baking and everything that goes along with it. Library sale find, and I have to say quit a nice one. This is the cookbook I use more than any other! It has not only regular recipes, but also interesting ones that don't require wacky ingredients! My all-time favorites are the Pesto-Walnut Risotto, Chicken Curry with Asian Pears, and the Macaroni and Cheese. Yum!